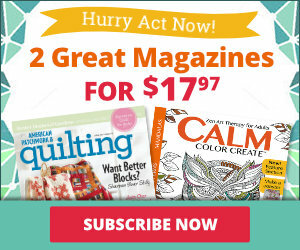 Two sets of 2.5" strips set in a staggered style make a fun quilt in no time! Click here for instructions. If you're like me, you fall in love with a set of 2 inch strips and then you wonder, what am I going to do with them? 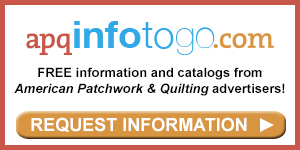 Hi I'm Linda Augsburg, Editorial Content Chief for American Patchwork & Quilting. In this Show Me How Video brought to you by Baby Lock and the Crescendo machine, I'm going to show you how to make this easy strippy quilt. You'll love it because it's the perfect size for a throw and it'll really showcase that 2 strip set that you fell in love with. For instructions, go to AllPeopleQuilt.com/ShowMeHowStripQuilt. Let's get started. For this project, you need two 2 inch strip sets, you'll need at least 37 strips of the print and 37 strips of the solid. 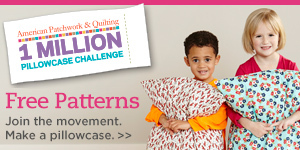 To make this quilt, you'll cut those pieces, cut the solids into 21'' lengths and cut your prints into 32.5'' lengths. You'll also need 5/8 yard for binding and 4 yards for backing. So the first thing that I did was sew the 21 inch strips to each end of the one of the 32.5 print strips, so I've got a long strip that's got a solid 21 inch piece on each end of it. Then I'm going to bring all those strips over to my design wall, and I'm going to start arranging them in a way that's pleasing to me. So the great part of the design wall is that it's typically a flannel or batting surface and your fabric will stick to it. So I can lay these up offsetting these seams and just stick them right to my design wall. But I want to make sure that these seams aren't lined up with each other and then I get a little back and forth play. Now I would continue and get all of my strips up on the wall and again I might play back and forth, you might have to play with the color combination and how you like which strip is against which thing. Once you've got that done, my first tip is to make a chalk line at the shortest edge on each edge. So that you're going to be, you're going to have a nice rectangle at that point. Then you can figure out kind of where your center visually is and trim that piece so that it's 61 inches wide, so you might be trimming off one side more than the other if you seem to have more strips going one direction than the other direction. Now the instructions say to trim all of your pieces even and then sew the strips together, otherwise if you'd prefer to make sure you don't have to trim twice, you can sew your strips together with uneven ends and then trim everything up at once, really it's up to you. One thing to note as your sewing your strips together, these are very long strips, so you might want to sew one direction and then your next strip when you sew your next strip on you would sew and turn the pieces so that your sewing this direction, that will keep you from always sewing in the same direction and pushing your seams a little bit and will keep things more even. 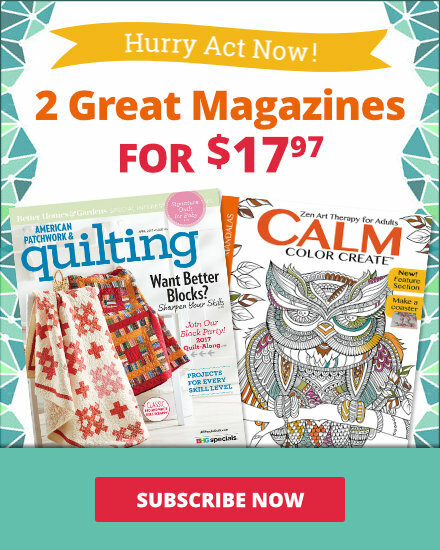 Now that you're piecing is done, all you need to do is layer it, quilt it and then bind it and your read to have this awesome quilt as a gift or for yourself. Again for the instructions go to AllPeopleQuilt.com/ShowMeHowStripQuilt. Thanks for joining us.